Monday is my 32nd birthday. I miss my mom and dad and my best friends-so for them, I will blog the festivities that will lead up to a fairly insignificant day for most, but another monumental year for me! It all started this morning with a call from my good friend Diane, who invited me to come along shopping with her and enjoying some lunch. I was released from my wifely and motherly duties (which of late has been round the clock care of the sick) and I took off for an afternoon of catching up on latest news and checking out the jewelry at Belk. It was fun. I love Diane. Just about any time with her is fun. We are planning a road trip back home in May and I CAN'T WAIT! Then, we picked up Kate...the highly demanded babysitter from BJU so that she could watch the boys tonight for my birthday dinner out. She was at Anne's and that gave us a chance to visit with my poor sick friend...who has the same bug that my family has had. I patted her on her poor, feverish head and it was off to dinner at Portifino's and the movie. I'm pretty much notoriously known for loving a good, scary movie. I tend to attract friends that don't enjoy them so much and my husband's side of the family OPENLY discourages them. My intellect understands why...They aren't good for your mind. They desensitize you to evil. They scare you. Regardless of these facts, I continue to line up for a good ole' horror flick! One of the first scary movies that I ever watched was called "When the Stranger Calls Back", so when I saw that they were going to re-release it, I was excited to see a version of it on the big screen. I remain convinced that the average scary movie today is actually NOT scary in the least because it is not realistic. People don't come back from the dead with knives on their fingers. Mothers don't die to save their "alive" children to parent resentful ghosts! Sharks don't really take revenge! Girls with long black hair don't crawl out of televisions! I have seen my fair share of scary movies and nine times out of ten I walk away disappointed because not only was it not scary but it was so typically predictable, I get drowsy before the second half and decide sleep seems much more appealing. I am a worrisome person. I imagine scary things that could really happen EVERY day! Is there no one like me that could take on a script and produce something realistically terrifying? Would this be so hard to do? 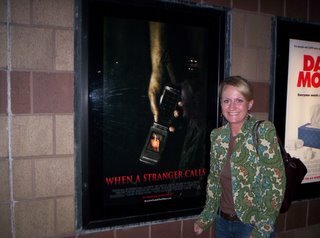 Well, "When A Stranger Calls" is a remake of a remake and I remember seeing the second version of the movie and being scared to death! It had all the elements of a true to life nightmare and left you feeling breathless and looking over your shoulder as you went upstairs to bed. I can only say that although I anticipated (by further BAD REVIEWS) being very disappointed with the third version of this film, it was surprisingly frightening and while I was frustrated that it was not covering the entirety of the first two productions...It left us knowing that they would be back for more! It was a good time had by all! I want to personally thank my mom for my demented mind that can only really appreciate a movie if someone dies in it! Thanks to her and "Murder She Wrote"...I never had a chance! Iam happy you are enjoying your birthday with friends... I miss you. I am thankful you have Matt. As I recall those unrealistic scary movies often caused you to end up in my bed, with Dad saying "what's she doing in here!!!" So hold Matt tight and say "I am not afraid, I just can't sleep. Please don't go to sleep, stay awake and talk to me. What Memories you've given me!! Uh....yeah right, Mom! Are you kidding me? I'm am on my own with this! Matt is MORE afraid than me!! Be Careful What You Wish/Blog For!